Sugar Press is very pleased to announce the “When She Rises” Print Collection. This very special series honors 5 groundbreaking women artists who are trailblazers in the field of Public Art. The powerhouse line-up features works by: Judy Baca, Juana Alicia, Susan Cervantes, Johanna Poethig and Alice Patrick. Their work speak volumes to the issues of both social and climate justice. As leaders in their field, each artist brings their own voice through visually stunning and powerful imagery. This series launches with SPARC’s Founder, Judy Baca, and her tribute piece:“Portrait of Dolores” Detail from Arch of Dignity, Equality and Justice.One of five painted portraits for the Cesar E. Chavez monument at San Jose State University. Our mission at Sugar Press, has always been to capture that spirit and bring it to life through limited edition fine art prints using ecologically sustainable archival materials. Each of these editions are produced on our 100% recycled Sugar Paper or sustainable Bamboo Paper with water based ink achieving the utmost in archival quality with vibrant pigments. 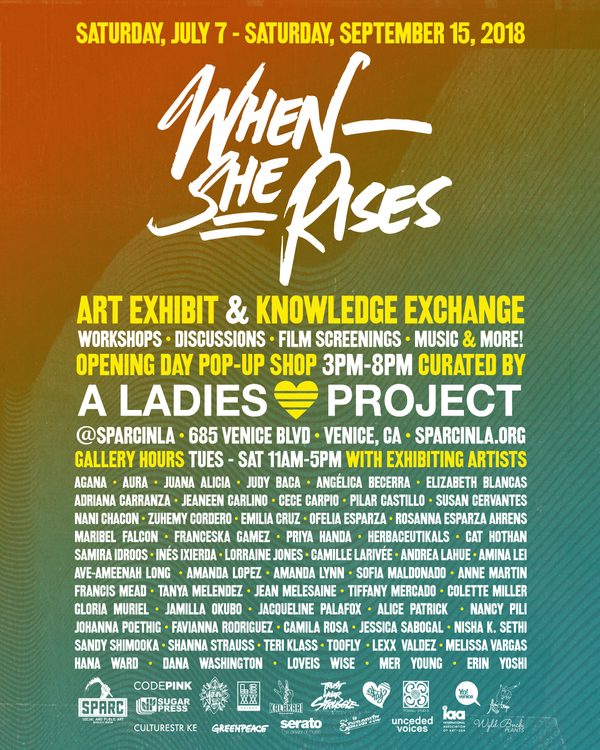 33% of proceeds support the When She Rises Exhibition at Sparc in July 2018!